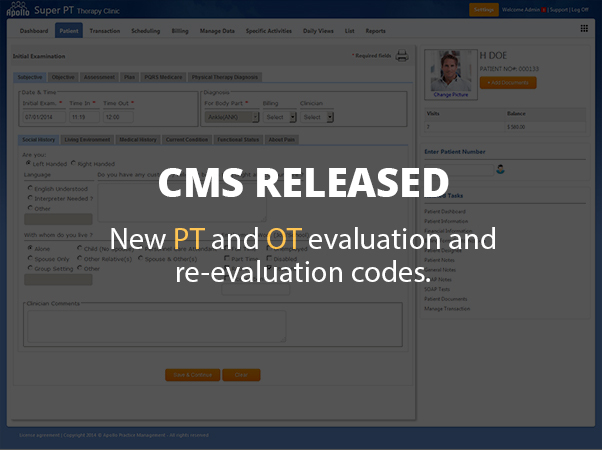 On July 7, CMS released information on the proposed new PT and OT evaluation and re-evaluation codes. CMS will finalize these codes and their reimbursement levels in November to be effective January 1, 2017. There are three proposed PT eval codes, three OT eval codes, and one new re-eval code for each discipline which replace codes 97001 through 97004. While there are three evaluation codes, one each for low complexity, moderate complexity and high complexity, CMS is proposing that they all be valued the same, and hence reimbursement will be the same for all three. The proposed unit values and reimbursement will be very similar, if not the same, as the current eval and re-eval codes. You can count on that once CMS obtains enough data about the usage of these codes, they may adjust their values in later years. The table below shows the proposed PT and OT codes and their descriptors. Clinical decision making of low complexity using standardized patient assessment instrument and/or measurable assessment of functional outcome. Typically, 20 minutes are spent face-to-face with the patient and/or family. Clinical decision making of moderate complexity using standardized patient assessment instrument and/or measurable assessment of functional outcome. Typically, 30 minutes are spent face-to-face with the patient and/or family. Clinical decision making of high complexity using standardized patient assessment instrument and/or measurable assessment of functional outcome. Typically, 45 minutes are spent face-to-face with the patient and/or family. Clinical decision making of low complexity, which includes an analysis of the occupational profile, analysis of data from problem-focused assessment(s), and consideration of a limited number of treatment options. Patient presents with no comorbidities that affect occupational performance. Modification of tasks or assistance (eg, physical or verbal) with assessment(s) is not necessary to enable completion of evaluation component. Clinical decision making of moderate analytic complexity, which includes an analysis of the occupational profile, analysis of data from detailed assessment(s), and consideration of several treatment options. Patient may present with comorbidities that affect occupational performance. Minimal to moderate modification of tasks or assistance (eg, physical or verbal) with assessment(s) is necessary to enable patient to complete evaluation component. A clinical decision-making is of high analytic complexity, which includes an analysis of the patient profile, analysis of data from comprehensive assessment(s), and consideration of multiple treatment options. Patient presents with comorbidities that affect occupational performance. Significant modification of tasks or assistance (eg, physical or verbal) with assessment(s) is necessary to enable patient to complete evaluation component. Typically, 60 minutes are spent face-to-face with the patient and/or family. A revised plan of care. A formal reevaluation is performed when there is a documented change in functional status or a significant change to the plan of care is required.